Salesforce Philanthropy Cloud is a game-changing technology platform that inspires, connects and empowers social change. It helps to better the welfare of the country. Philanthropy Cloud lets corporate employees have a record of all their matched giving–and will help guide them to other organizations, information, and ways to help in person. It helps the organisation to think in a different perspective by contributing to the society in the best way they can. It’s the only platform for social purpose backed by the world’s largest nonprofit and the world’s most innovative company. It is a global platform that creates a relationship between employees, clients and accomplices with the causes they care most about. It is the main worldwide utilization of advanced innovation that brings social and individual purpose together. 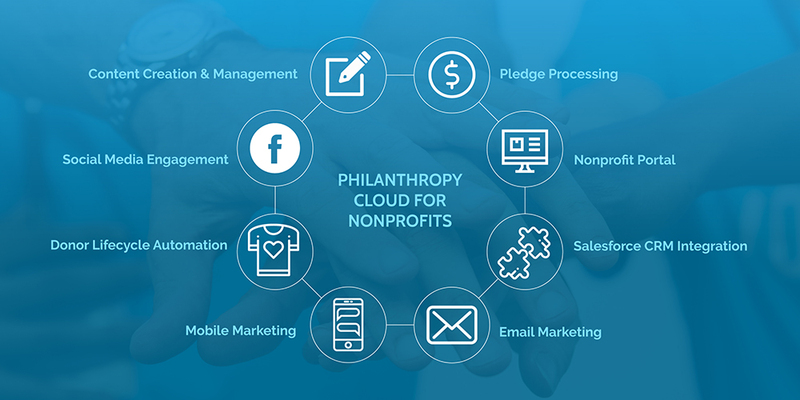 Built on Salesforce Customer Success Platform, the Philanthropy Cloud will provide corporations with a suite of nonprofits to choose from. Employees will log onto the platform, answer a few questions about their preferences, and receive tailored recommendations from Salesforce’s AI-powered Einstein. Einstein can surface the most relevant nonprofits, impact funds, fundraising campaigns, and related stories based on an employee’s interests, location, giving history, and other signals. Gives companies an advantage in the talent war, giving young employees more power to engage with social issues 24/7, and to connect with change makers and follow employees. Makes employee engagement dramatically easier, more efficient and more effective. Helps companies streamline, modernize and expand existing philanthropic programs.